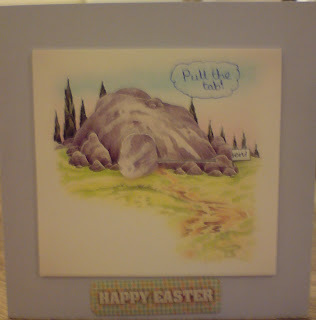 Tigerlover's cards and creations: Happy Easter! 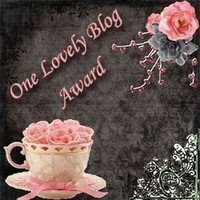 Hello everyone, here is the second card uploaded to my blog. It is a card I entered for the 'design a card for Easter' competition at school. Although both my mum and myself feel that it is a brilliant card, I did not find myself in the group of winners. I hope you will like it though. 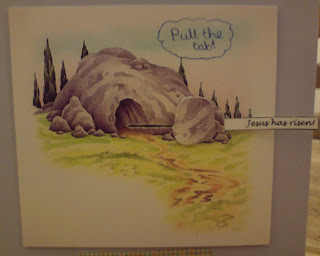 One of the rules was that it was supposed to be a Christian card and not one with Easter bunnies and eggs and the like. If you look closely at the picture of my card, you will see that it is actually an adapted slider card. 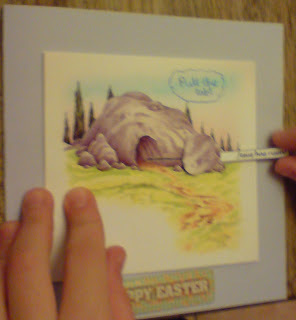 A card where there is the rock blocking the entrance to the cave. 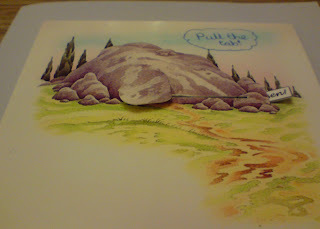 You will also notice a little cloud in the sky, which tells you to pull the tab. 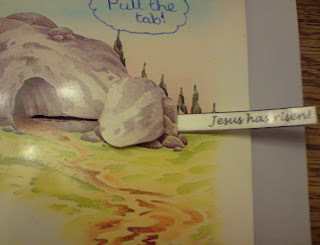 Pulling the tab, will reveal a message and move the rock away from the cave, showing the empty cave after Jesus has risen. This is also the message on the slider. 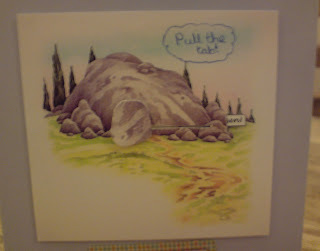 I do hope you like the card, it was all my own idea, and my mum only helped to resize and print the picture, develop a 'rock' and print of the resized slider system. I then put it all together (with a little help from my mum. I thought it was real fun making this card and I am quite proud of the card. Just a close up of the card again. Hope you like my card, all comments are very much appreciated. Thank you for looking! Well done on your new card, it is brilliant. Sorry you didn't win, but you could always enter it in the trimcraft challenge and see what happens there. and wishing you loads of luck in the trimcraft challenge. 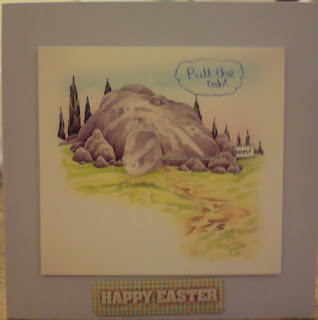 Its a wonderful card love it, and wishing you loads of luck in the Trimcraft challenge. 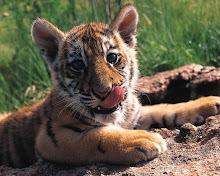 Hi Tiger I missed this the other day.You've done a brilliant job here,well done.